Scratch Hardness for Oil, Petroleum & Paint Testing - determining the scratch hardness of ready mixed paints and enamels, which is the minimum load required to produce a scratch showing the bare metal surface of the painted panel. The apparatus consist of a 1mm dia hemispherical stainless steel needle, fixed to a platform of a counter-balanced rod which is assembled on a grooved platform. A rack moves through the groove, to which a painted panel can be clamped. An indicator lamp is provided to indicate the metal penetrates the paint surface to make contact with the metal. Complete with 1 kg weight. Suitable for operation of 220V, 50 Hz, single phase, AC supply. Extras : - Needle. We are leading manufacturers, suppliers & exporters of Scratch Hardness For Testing Lab for Oil, Petroleum & Paint Testing Lab. 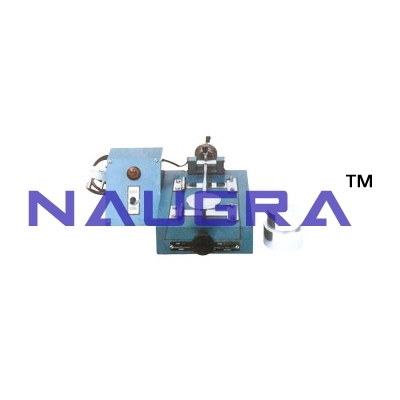 Contact us to get high quality designed Scratch Hardness For Testing Lab for Oil, Petroleum & Paint Testing Lab for schools, colleges, universities, research labs, laboratories and various industries. We accept bulk orders for government tenders in all countries around the globe.